This is Julie Davidson Smith’s first solo show in Kingston and her first exhibit with Studio22. It is also her largest body of work to date. After becoming a mother a few years ago, Julie altered her practice to accommodate the presence of her child. Acrylics became her mainstay and she has worked over the past 2 years to put together a body of work that is exhibit-ready. 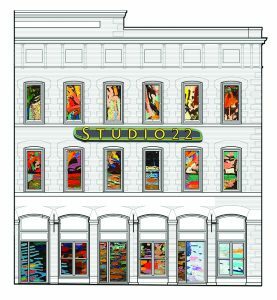 Studio22 is delighted to be able to offer Kingston first dibs at these vibrant, life affirming new works. A graduate from Concordia University’s Fine Arts program Julie has 20 years of experience exhibiting art professionally and sharing her knowledge as an instructor not only in her studio but for Queen’s University, the Limestone District Schoolboard, Providence Care’s Community Recovery Connections Program and the Agnes Etherington Arts Centre. Julie is a multi-award-winning artist with several Best of Show awards for juried exhibitions in Kingston. Being creative has always been about the joy of making something and the challenge of solving visual puzzles and expressing myself in a realm without limits or rules – a place of mystery. I let my subconscious become the pilot that directs the flow and feeling behind my work, images of drifting bodies in foreign landscapes, clouds, rain and shapes erupting like a birth are constants in my visual language. The ritual of applying paint is a translation of my life experiences and an outlet for my desire to find and create beauty that is meaningful and seductive. This makes me feel alive, being surprised by what unfolds and giving my memories and ideas a voice. Seeds of inspiration and influence were planted years ago by discovering the vibrant art of the late Henri Matisse, Paterson Ewen, Georgia O’Keeffe and recently by British artist Tom Hammick. Their art is rich with mystery; I am inspired by their use of colour and their emotional landscapes. I embrace the unknown territory of art making, I seek to discover what waits for me there on the other side. Tuesday to Sunday – 11 to 5 pm & evenings Thursday (to 8pm) and Friday (to 10pm).